Europa Aircraft, maker of the Europa XS homebuilt kit, has come out with the Europa Motor Glider. The development aircraft first flew in February 1992. The key is a new 42-foot-span wing that can be mated with the existing Europa kitplane fuselage or built as part of an all-new airplane. Designed by Airbus Industrie aerodynamicist Don Dykins. The 43 foot span wings give a glide ratio of 26:1 and a stall of 45 kts at mauw. The aerobatic Europa features an easily removable wing, so one for cruising and one for soaring. The 13:1 aspect ratio wing has trailing edge airbrakes to steepen descents. The Europa XS Motorglider is available both as a Monowheel or Trigear with comparable performance and specifications. The advantage of the Motorglider is that in most countries it can be flown without the need for a full aviation Class II medical. 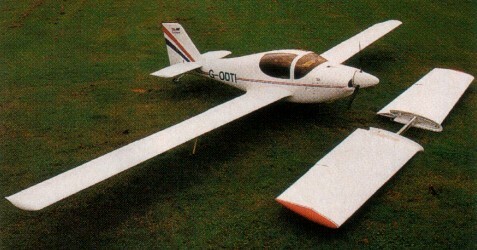 The Motorglider can be supplied with a number of different engines, although recommended are those from Rotax. The Rotax engines currently range from 80HP through to 115HP. The latter unit being turbocharged.